In preparation for a prosperous future, Parker Precision continue to uphold its long term strategy of investment in capital equipment and a dedication to utilising state-of-the-art technology. Most recent purchases include a STAR SR-20RIV and a STAR SV-38R, both of which commenced production in the Bilston based factory in January 2015. The SV-38R was the first to be sold in the UK, testament to Parker Precisions objective to remain at the cutting edge of precision engineering technology. The SV-38R gives Parker Precision all the advantages of the 20m/m machine, but with a bigger bar capacity of 38 m/m. Total investments in new machinery come to £500,000 for 2014/2015. 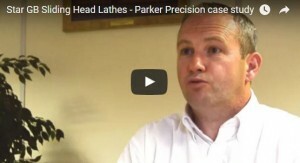 Parker Precision are now working hard to raise their profile across a range of industries. Proudly showcasing their precision engineering technology and expertise, in order to fill the increased capacity and continue to drive the company forward through 2015. Parker Precision welcomes you to visit the factory, experience our facilities first hand, meet the team, and explore the opportunities that can be gained from working with a long standing yet innovative precision engineering partner. If you have any questions on Parker Precision’s capabilities and would like to discuss how we could work together on your next precision engineering project, email sales@parkerprecision.co.uk or call us on 01902 353453.